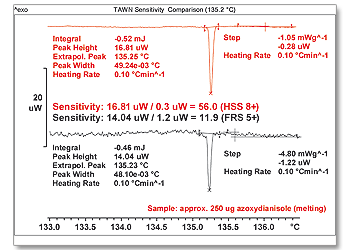 Differential scanning calorimetry (DSC) is the most frequently used thermal analysis technique. DSC measures enthalpy changes in samples due to changes in their physical and chemical properties as a function of temperature or time. The DSC utilizes an innovative DSC sensor with 120 thermocouples which guarantees unbeatable sensitivity and outstanding resolution. Measurement principles Differential scanning calorimetry (DSC) measures the difference between the heat flows from the sample and reference sides of a sensor as a function of temperature or time. Differences in heat flow arise when a sample absorbs or releases heat due to thermal effects such as melting, crystallization, chemical reactions, polymorphic transitions, vaporization and many other processes. Specific heat capacities and changes in heat capacity, for example during a glass transition, can also be determined from the difference in heat flow. You can adapt the system to your requirements depending on the temperature range in which you want to measure. The IntraCooler is a sealed system requiring only electrical power. It is therefore advantageous in locations where liquid nitrogen is undesirable or not available. Liquid nitrogen cooling offers greater flexibility because it allows you to measure over the entire temperature range. Experience the ultimate in ease-of-use thanks to experiment launch with One Click™ and built-in gas handling. 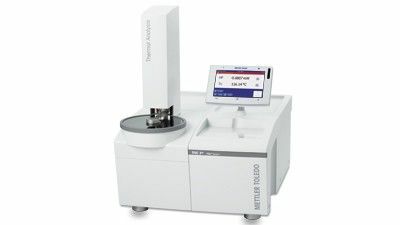 A cleverly designed, factory endurance tested autosampler with single axis movement and flexible crucible handling provides efficient and reliable routine operation around the clock. Thanks to their modular design, the DSC instruments as part of the METTLER TOLEDO Thermal Analysis Premium or Excellence Line are the best choice for manual or automatic operation, from academic research and industrial development to quality assurance and production. The DSC utilizes an innovative patented DSC sensor with 120 thermocouples which guarantees unmatched sensitivity. A quantum jump in sensor technology enables us to offer the highest sensitivity sensors available in DSC instrumentation and allows you to detect the weakest thermal effects. The signal-to-noise ratio, an important instrument parameter, is determined by the number of thermocouples and their specific arrangement. The signal time constant determines how well close-lying or overlapping thermal effects are separated from one another. We set unprecedented and unparalleled performance standards due to our high thermal conductivity ceramic sensor material with its low thermal mass. Face your new measurement requirements with flexibility: protect your investment through the modularity and upgradeability of our innovative instrument solutions.